Once again we have here a convergence of interests. 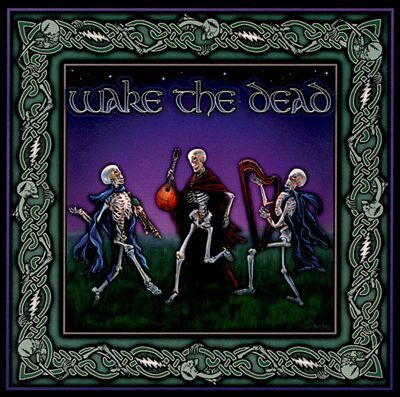 I first got into Irish history through Irish traditional music, so when I heard about Wake The Dead it was a no-brainer for me to pick up this album. The whole thing is spectacular, but I think that Row Jimmy has a little something extra in it. As such it’s a great way to cap off the album. What is that little something extra? Well for me it’s the inclusion of pipes and harp in the arrangement. In reading Blair Jackson’s Garcia biography I was interested to read that toward the end of his life Garcia went to Ireland a few times and really liked it over there. (I mean, who wouldn’t?) I know he had met Paddy Moloney from The Chieftains and liked their music. Given that, I assume he would have liked, or at the very least been interested to hear some songs from his own body of work transformed with an Irish twinge. Whereas the Grateful Dead’s Row Jimmy was usually on the slower side of mid-tempo, this version is almost a dirge. The call to order comes from a set of bagpipes (These are Uillean Pipes, which tend to be a bit more gentle on the ear than Highland pipes!). When the rest of the band joins in, there’s a bit more lilt to the music and it’s clear that the arrangement is Hiberno-influenced. Not only are there pipes, but harp as well. The playing throughout is meticulous and beautiful. Vocals are a strong point as well. Just check out the chorus after the last verse. The accompaniment is sparse at best, and the vocals shine. The song fades out slowly – a fitting end for this Hunter/Garcia classic. Tagged Dead Cover, Irish, Wake The Dead. Bookmark the permalink. That was beautiful, I got goose bumps from the bagpipes. Agreed. Bagpipes may be a turn off to some, but that’s just because of the association with Scottish Highland pipes. Irish pipes have a very different sound and really makes this track sparkle. Glad you enjoyed it!